This pattern was an instant purchase for me. As soon as I had seen the new pattern releases from Sew Liberated, which by the way, I would happily make all of them, I ordered this straight away. I liked the yoke detail and the sleeve length and could imagine this fitting in to my everyday wardrobe. The patterns have a format I haven't seen before. The instructions are intentionally basic and within them you are given a code to enter in on the Sew Liberated website to watch a step by step video tutorial. This is helpful, but personally I would liked to have had everything I needed inside my pattern envelope. I entered my code and watched along in the background, some steps needed this video, others I found easy enough to do on my own. Personal preference there I suppose. Some people like video tutorials, some prefer written ones. The first stage of the construction is to finish all your raw edges with a tricot stitch. I was unfamiliar with the tricot stitch, but familiar with Meg's method of finishing edges prior to sewing. I have used her patterns before from her Growing up Sew Liberated book. Back to the tricot stitch. I didn't know my sewing machine did one. After looking in my manual I found out it did. Hurrah! You have got to love a sewing pattern that teaches you something about your machine. Here it is.... stitch number 5 on my machine. The video explains the need for the tricot stitch over a regular zig zag. It is made up of 3 stitches per zig and per zag and this stops the stitches from bunching up the edges of the fabric as you stitch. Here it is on the raw edge of my work. It irons nice and flat and doesn't steal any of the seam allowance. I had to do a comparison to confirm this (naturally) and they were right, the stitch below is the regular zig zag. See how the fabric is puckered? In the process of attaching the bib, you have to do a bit of folding fabric out of the way to get a finished appearance with the facings. It all looks nice and neat from the inside once you are done. I took a photo of each step as I went along. The photos show the back panel right side up with the front panel right side down on top. Photo 1: Sew bib nearly up to the shoulder edge, leaving 2" free at the top. Fold that flap of facing fabric back out of the way. Go back and sew only the exterior fabric to the front panel. Photo 2: Attach the back facing and after pressing the neckline, unfold it and match up the raw edges of the front and back facings. 4. Sew in place and press the seam allowances open. 5. Fold all the facings back into place on the wrong side. The last 2 photos show the finished top from the inside and the outside. The rest of the top was nice and simple to construct. 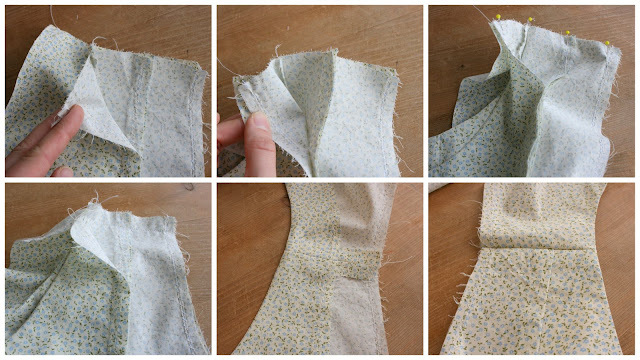 I chose five small pale blue buttons to finish off the bib opening and I sewed them straight through all the layers without doing buttonholes. The top has pretty gathers to the front yoke. The sleeves aren't gathered at the top of the shoulder but at the cuff instead. This creates a puffed sleeve at the bottom with a nice deep cuff that rests over the elbow. This top has a nice summery feel to it especially with the floral print I chose. The fabric is a cotton poplin. The suggested fabrics for this top are cotton, voile, double gauze or flannel. I want to try a voile as I think the drape would be lovely. too big for me. The main body is too wide and I will have to go back and take it in. In the photo above I am keeping the sides from looking huge. It is obvious I will have to go down a size next time. Despite this version being too big, I think it is a beautiful top and a really great pattern. I would highly recommend trying it out, especially if you are a Tova fan and fancy making something slightly different. The shape of the bib is feminine and delicate and I really like it. Thanks! Do it, this would look great on you! Thanks for sharing one of the new SL patterns. I am working on the Clara Dress and have a small chest and wide hips. I am deciding what size for the top and your comments on sizing help. You're welcome! It does help to see a test run first. This is my first adult SL pattern and they use the same measurement charts on each one so I will know for next time to size down. Good luck with your dress! I hadn't heard of this pattern before...like Justine, I'll have to investigate. ;) I like the design details on the shirt!